The widespread reforestation of the Northeastern United States has been accompanied by a reintroduction of beaver (Castor canadensis) throughout the region, resulting in profound changes to stream and meadow ecosystems. In contrast to the large body of research on beaver biology and their wetlands, impacts to the adjacent forest from these ‘ecosystem engineers’ are poorly understood. We are studying the dynamic relationship between landscape drivers of long-term site use by beavers and their reciprocal influence on forest communities adjacent to their ponds. At a SUNY-ESF research forest in the Adirondack Mountains of New York State, we are using a 30-year record of beaver lodge occupancy to (1) test a process-based model of landscape controls on the duration of beaver occupancy; and (2) quantify the spatially-varying impacts of beaver foraging on forest tree composition and structure. This research will help to better understand the widespread and long-term effects on forests from a keystone species that is increasing in influence throughout North American and Europe. My current focus is on expanding work done on beaver impacts within the Huntington Wildlife Forest (HWF) to public lands throughout the Adirondacks, to see if the results from our small-scale study at the HWF are applicable to the greater Park. This research may have truly exciting implications for land management moving forward - adaptive management of beaver recolonization has promising applications in wetlands restoration, endangered species recovery, and ecosystem remediation, just to name a few areas. If you’re interested in seeing an interactive map of my field sites, click here! Links lead to posters or slides for that presentation. Mahoney, M. J., and Stella, J. C. (2018). 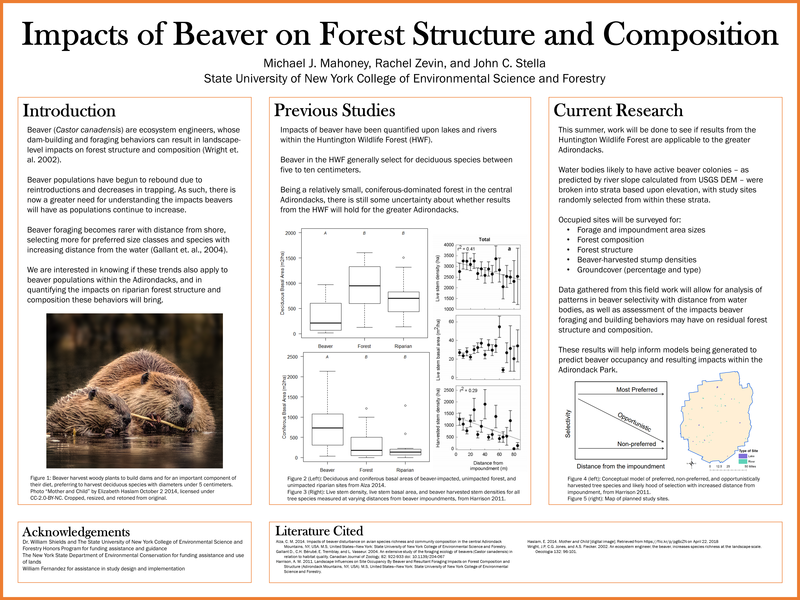 Beaver Foraging Preferences and Impacts on Forest Structure in the Adirondack Mountains of New York. Contributed talk at the Forest Ecosystem Monitoring Collective Conference, Burlington, VT.
Mahoney, M. J., and Stella, J. C. (2018). Beaver Foraging Preferences and Impacts on Forest Structure in the Adirondack Mountains of New York. Contributed talk at the Rochester Academy of Sciences Fall Scientific Paper Session, Geneseo, NY. A talk on beaver impacts in the Adirondacks at the Forest Ecosystem Monitoring Cooperative Conference. A talk on beaver impacts in the Adirondacks at the Rochester Academy of Science’s Fall Paper Session.